This week has been a strong bull week so far. We got a nice bull spike and channel pattern Wednesday and Thursday. This took price to a 100% expansion of the lower channel(from the midline). Price stalled at resistance and made a deeper pullback. Now price is in a trading range and possibly a final flag before a correction or continuation. 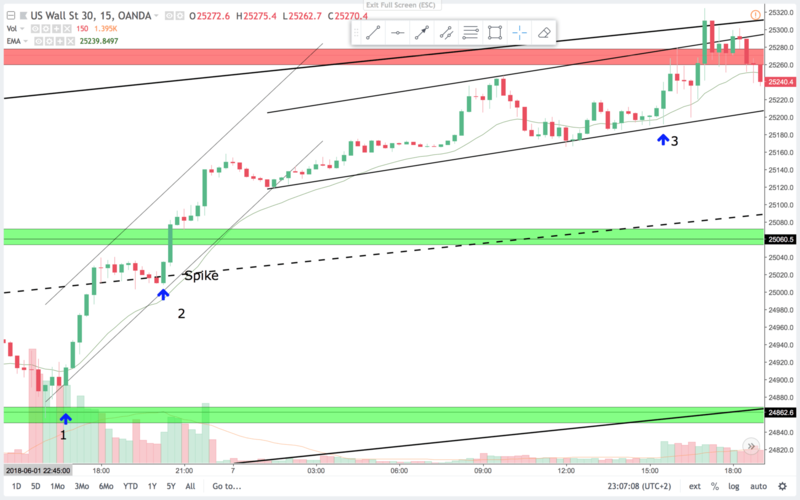 I found three nice trades of the 15 min charts to go over today.Price was always in long, this week or at least after the break above the 24.860 area. By then I only looked to go long. On the 15 min chart this is a great signal and a bear trap. You just got a break of the resistance and this is the pullback to test it as new support. Price made a second entry long and this is the higher low after that signal. The signal bar followed a bear bar that closed on the low. Bears that sold this bar had their stops just above it and that fueled the trap. Then when the marked closed the signal bar a large bull bar with a large tail below. A higher low, and at support I liked to take a trade on that. Turned out to be a really good trade. On the 15 min chart price just made a really strong bull leg. Price is still a bit from the resistance area above. 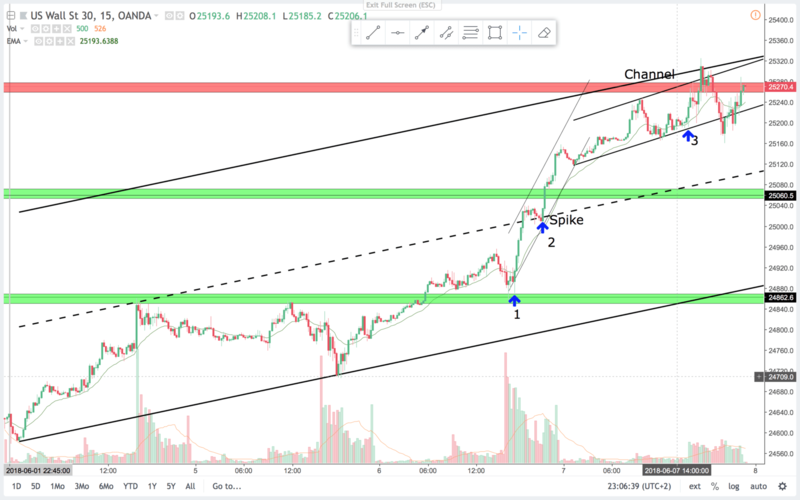 I was expecting the first move to be a spike and the bull flag to be the beginning of a channel. Price only corrected sideways and the large bull bar that opened on the low and closed on the high was a good place to go long. 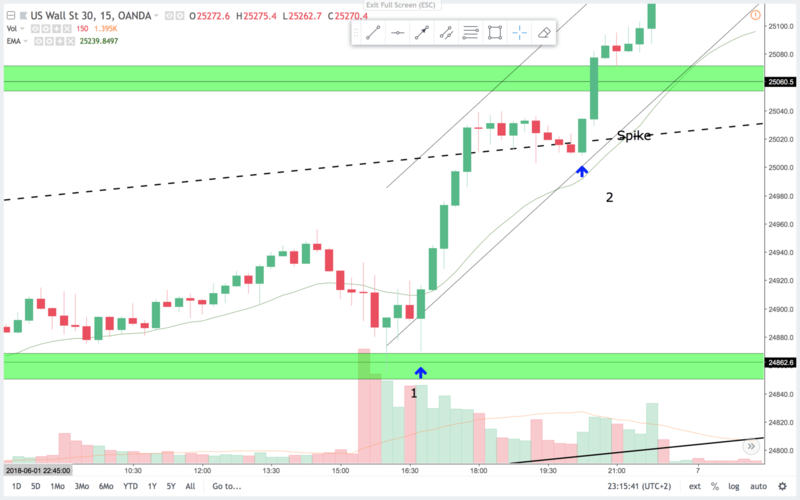 In a spike phase you can go long for any reason. Turned out we got another spike, and another really great trade. Lots of money in the runners on this trade. On the 15 min chart this is the open bar of the day. It trades lower first then higher and closes near the high. I like that for a from the open bull trend. You get the scalp and the runners are stopped out. The signal is right of the trendline and there is room for a scalp up to the channel line above. Price made a deep pullback after a couple of dojis in the first 90 minutes of trading. This tells me, that today context(so far) is trading range context. 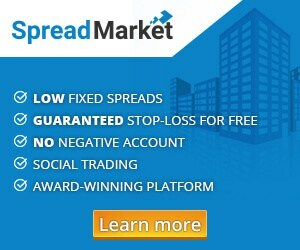 In a trading range, buy low sell high and scalp. Often in a trading range it is better to wait. When managing trades in a spike breakout market you make more money buy scaling in and moving you SL higher to protect profits. These days can be epic for you trading account. If I normally scalp out half of my position, I will add on in a spike and BO context too double or triple my normal size. Then I will scalp out a full position and run the other positions.